I've been going through a prospective job change, so there has been NO time for the tent. Interviews, and more interviews, phone calls and consultations leave no time to play. I hope to get some posts off today and over the long holiday weekend. in Shanghai, China during WWII. How did they manage to lure the greatest minds to RIETS? HaRav Nachman Yosef Twerski is what you might refer to as TCHBRR, (the could have been Rachmistrivka Rebbe). As a Bochur in the '70's he left his father's home and traveled to New York to learn in Tomchei Tmimim. His father, Reb Yisroel Mordechai, and his grandfather Reb Yochen'tshe of Rachmistrivka were not very happy when they heard the news. Letters were sent to the Rebbe to "dissuade" NY and send him back home. After all, it's one thing to leave your father's home if he's a Rebbe and join another, it's another thing to become a Lubavitcher. 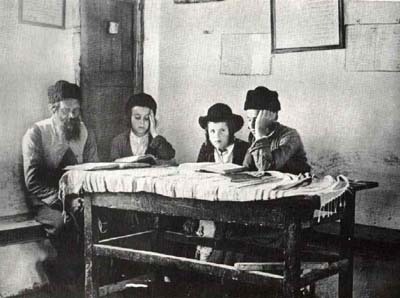 The Rebbe basically told them that the boy must learn במקום שלבו חפץ, and he won't be the one to get him to leave. They were not happy, to say the least. According to our newly-found friend A Litvshe Yid, this Chabad hatred has been going on even when we didn't think it was. He quotes a post on Hirhurim quoting a Brisker Talmid who heard it from Rabbi Avrohom Yehoshua Solovetchik, the torch-bearer of the Brisker attack brigade. I understand that it's not a first hand report, but coming from AJS I can believe it. "Reb Elchonon Wasserman asked Reb Chaim Soloveitchik how is it that Rav Kook (who he knew) could go so far off the derech (huh?) when everyone knows that he davens with such Kavana & fasts most of the week! RCS answered him "Dayge Nisht, Der Chabadske Apikoyrus is a Baal Gayve, Un Er Est Gants Gut!". We all know of the Rabbeyim's connection with Bais Volozhin-Brisk. from the times of Reb Itzele Volozhiner things had gone well between the two families. The Rabbeyim spent much time with the Rabbonim of Volozhin-Brisk, and I would imagine held each other in some esteem. There is a story told of the Frierdige Rebbe sharing his opinion of "Misnagdim" with Reb Chaim and the Rebbe Rashab when the word was mentioned, but that's an exception to the rule. 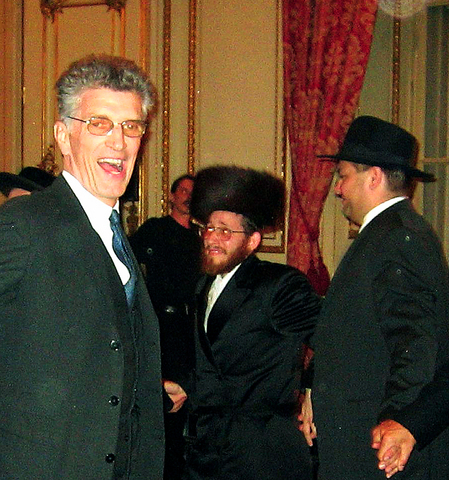 The Brisk-Volozhin family was seen as "nit-Chassidim" rather than "misnagdim." Which raises the question: Why bring up the Chabad connection to Rav Kook when criticizing him? not to mention the connection was somewhat indirect, his mother being from a Chabad family. Was it all just a show ? and why the need to be so degrading as to insult him personally? "All power to the Soviet!" Some of you may know about my run-ins with the Bolshevik formerly known as Tzemach. I have been banned from even VIEWING his site, a harsh punishment that's the equivalent of scrambling FoxNews in China. He has also virtually approached posters who comment here not to enter "the tent", threatening to ban them if they do. For a while there I thought that he had recovered from whatever irked him, but I was wrong, Bolsheviks do not forget nor forgive. Which gets me to wonder: Why is it that a blogger who claims to seek the truth and expose the wrongdoings of the mainstream Charedi press and society and the PR machines of certain groups does the same thing? Does he not prove himself to be one of the same? Does his dishing out of terms like "Idiot", "Hungarian from a rathole" give him the feelings he never feels? There is a certain rush and excitement to arguing over the internet about "hot" topics, especially with people who were spoon-fed hatred towards Lubavitch from their youngest years, but it's nothing but foolish. Other topics can be discussed, but not these because people generally do not change their opinions concerning other people. I had originally set up this blog as a free forum of opinions that would encourage civil and clean debate. We would discuss similar issues with no fear of "the knock at the door" by the goons (banning for those of you in BP). I do not ban anyone, no matter how stupid and disrespectful the remarks. Malach will attest to that. I realize it's easier to run a blog focusing on the negative, but that's the break we have to deal with, we try and take the somewhat higher road. I encourage your comments, especially with names attached to them. If you're afraid of retribution e-mail me and tell me your new handle/name. Tell your friends and visit often. I wish TA a רפואה שלמה בתושח"י, and may we hear only good news. Tuesday June 28th, 8pm in the Young Israel of Flatbush (Ave. I & Coney Island Ave.) on Perek Shirah: The Spiritual Secrets of Nature's song. Creation, Dinosaurs, and the Age of the Universe. 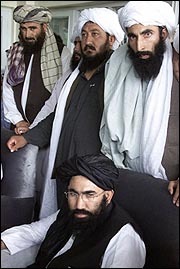 The Tzig bears no responsibility for subsequent riots, excommunications, or book-burnings slated to happen. Robert F. Maguire Jr., the chief pilot of an airlift operation that brought well over 40,000 Jews from Yemen to Israel in the early years of the state, died earlier this month at the age of 94. Maguire was a chief pilot for Operation Magic Carpet between late 1948 and early 1950. He died on June 10 at his home in Northridge, Cal., of natural causes. Pogroms against the Jews of Yemen followed soon after the United Nations voted to partition Palestine into Jewish and Arab states in November 1947. In the worst incident, Muslim rioters, joined by the local police force, engaged in a bloody pogrom in Aden that killed 82 Jews and destroyed hundreds of Jewish homes. The Imam of Yemen agreed to let most of Yemen's Jews leave, though the operation was kept secret and was released to the media only several months after its completion. The Jews walked on foot, sometimes for months, in extremely dangerous and risky journeys to reach the capital Aden, from where they were flown to Israel. In an arduous and dangerous operation, nearly the entire Jewish population of Yemen was evacuated over the course of more than two years, on some 380 flights. The flight from Yemen to Israel, a journey of more than 1,400 miles, was almost entirely over hostile Arab territory. The planes were routinely fired on by Arab forces, fuel was scarce, and pilots were warned that if they were forced to land in enemy territory, they risked being executed. Maguire became a pilot for Alaska Airlines after World War II. With the creation of the State of Israel in May 1948, the The New York Times reports, the airline won a contract to fly Jewish refugees there from around the globe. Maguire flew thousands of Jews out of Shanghai before being sent to the Middle East to help start Operation Magic Carpet in conjunction with the American Joint Jewish Distribution Committee. When Alaska Airlines had to withdraw a few months into the operation, Mr. Maguire started his own company, Near East Air Transport, and hired planes and pilots to continue the job. Maguire once had to drop down to several hundred feet above the ground, squirming through hills and in between passes, to evade Arab gunfire. In another incident, he ran out of fuel and was forced to land in Egypt. When airport officials rushed up to the plane, the quick-thinking pilot ordered them to send ambulances immediately, explaining, "I have smallpox on board." The Egyptians immediately obtained fuel for him, and he proceeded on to Tel Aviv. David Ben-Gurion, Israel's first prime minister, was reported to have called Maguire "the Irish Moses." The Yemenite Jews had long lived in isolation from the rest of the Jewish world, and Maquire and the other planes presented the fulfillment of their hope and faith to return to Israel "on eagles' wings." The Simon Wiesenthal Center awarded him a medal of valor last year. As many as 28 pilots at a time were involved in Operation Magic Carpet, which involved carrying the refugees to Tel Aviv, flying back to Cyprus for the night - it was unsafe to leave the planes vulnerable to Arab bombers over night - and returning to their start-off point in eastern Africa at dawn before starting over again. The total round trip was about 20 hours. The work cost Maguire his career, as he contracted a parasite in the region that affected his heart, causing him to lose his commercial pilot's license in the early 1950's. He is survived by three children, eight grandchildren, and eight great-grandchildren. On Friday, November 29, 1947, the United Nations debated the issue of partitioning the British Mandate for Palestine into two countries, one Arab and one Jewish. 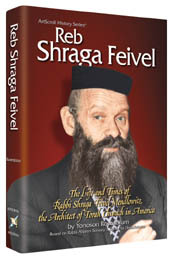 Reb Shraga Feivel prayed fervently for partition. He had no radio in his house, but that Friday he borrowed one and set it to the news, leaving it on for Shabbos. He waited with such tense anticipation to hear the outcome of the U.N. vote that he did not come to shalosh seudos. When he heard the U.N.'s decision to establish a Jewish state, he stood up and recited the blessing הטוב והמטיב . In a similar vein, he also explained why the secular Zionists might have been chosen to play such a fateful role in the history of the Jewish people... Divine Providence might have arranged that the secular Zionists play a major role in the redemption of Eretz Yisrael precisely in order to maintain their connection to Klal Yisrael. In a conversation with the Satmar Rav, shortly after his talk on the U.N. declaration, Reb Shraga Feivel was subjected to the sharpest criticism for his "Zionist leanings." Later he told his family, "I could have answered him Chazal for Chazal, Midrash for Midrash, but I did not want to incur his wrath, for he is a great man and a tzaddik." He added with a twinkle, "And besides, he has a fiery temper"
I'm very surprised Artscroll would print this, maybe they were not as PC then, I doubt they would write it now. "I could have answered him Chazal for Chazal, Midrash for Midrash, but I did not want to incur his wrath, for he is a great man and a tzaddik." He added with a twinkle, "And besides, he has a fiery temper". Others did incur the wrath, I guess it was before Yossel Ashkenazi could control him. The haters will jump out of their seats and start quoting Kuntres U'Ma'ayon and the Sefer Tikkun Olam, and there's no disputing that, but we need to trust the adaption that was made by the Rabbeyim in policy with regards to the "Zionist entity" a.k.a. Israel once it WAS established. Let's leave the sticking of heads in the sand to the haters. Much has been said in the names of the FR and the Rebbe with regards to what their reactions were on those fateful days of November 29, 1947 and May 14 1948. I have yet to draw a clear picture of it maybe some others can. However, the approach that Medinas Yisroel was founded by the irreligious so as to keep them connected to Judaism WAS negated by The Rebbe Rashab, at least in 5662. Why the infatuation with a bunch of Torah Vodaas Yankee kids who put on Chassidic costumes? Why the fascination with a Chassidic man who was very sure of himself and...... well.... not many other people? Why the infatuation with a bunch of radicals from the Bronx? Why the need to attack Jewish Giants like Reb Shraga Feivel Mendelowitz as "maskilim" and their Yeshiva as a Gymnasium (uchedomeh) when it was the only Yeshivah in Brooklyn raising Religious youngsters? Why is it OK to bring up the past of שוכני עפר whose only crime was to be born to a traditional but maybe unorthodox family? Well, for all those who were still holding out hope that Chabad would somehow disappear from the Ukraine and the FSU, sorry guys. Koristin is near Vilednik, where a large group visits in Teves for the Yohrtzeit of the Shearis Yisroel zt"l.
I've seen recently where the discussion turns to חכמים הזהרו בדבריכם. The geniuses who choose the verse also decide to whom and where to apply it. So, if some ignoramus boor who just recently opened a Tehillim or any other Sefer decides to translate some Posuk like בני בכורי ישראל, to mean that Hashem ח"ו etc. The Tehillim will not be blamed, obviously, for the boor's obvious mistake. If this guy "runs with it" and makes this into some kind of movement, like has been done in the past, the Tehillim will still not be blamed. The problem and the distinctions arise when other works and words are the sources for these people to misconstrue, like someone you already don't like, so you blame him for not being careful. 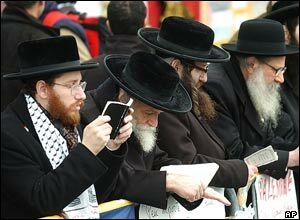 For example, a previous post discusses a wonder of nature called "Neturei Karta", with it's many chapters and branches. These specimens, as much as you may not like it, do the dirty work for a large part of the zealot community, and are defended and supported. Of course, they'll be condemned in the open and will be distanced from any other political group, but they will be supported financially and unofficially. I myself have been to many Simchas where these individuals have shown up, and they're quite friendly with the locals in some Brooklyn neighborhoods. You may ask "Where's the problem with that", and whose words are they distorting? They distort little known and irrelevant quotes, Midroshim, Gemorres, etc. to defend what they preach, namely words of the previous Satmar Rov, z"l. They have former Talmidim of the Satmar Rov as their Rabbinic endorsers, albeit from a distance. They quote him at every opportunity, as well as many others. So, why weren't those Rabbonim more careful with their words, foreseeing what lunatics like that could do with them? Did they not have the foresight that they had in other areas, or so is claimed about them. Most of the followers have axes to grind, like Beck, or have no Mesorah to follow, like the guy from Vienna or Weiss, or other converts and newly religious who are the mainstays of these organizations.They are basically the same types of people who make up the fringes of groups like Lubavitch, Breslov etc, yet they get a free ride as far as their sources go, whereas the Lubavitchers don't. "They should've foreseen this" is what the zealots say. I foresee a double standard, what about you? The Amshinover Rebbe of Yerushalayim with Shlomo Carlebach. Another impression I had was that both Aish and Ohr Someach were to be supported because they combat Chabad, and show the world how it "really should be done", making Baalei Tshuvah that is. They do not proselytize about the Rebbe, they do not teach Chassidus, they "stick to the basics", just getting them to be Fine Jews. Was I surprised to see that according to their website, Aish HaTorah is going into the Hesder business, that's right, they're starting a new Hesder Yeshivah. So, where's the outcry? Where are those Rabbonim who support Aish Hatorah, members of the Charedi mainstream, who are so vehemently opposed to anything Chabad does? log in every time you want to comment. There are those who claim to love G-d and defend his laws, then they go and do the craziest things, things that make the G-d haters out there even more brazen. Those of you who watched the Arafat dying fiasco in France last year will remember this guy,he's the Arabphile on the left, praying for his majesty's speedy recovery. A while back he tried to make a Bris in Antwerp, where his in-laws live, but he was thrown out of Shul. Now, he's made a Bar-Mitzvah for another hopeless child of his in Vienna, and look who came to the party. Seems like he's trying to gain state recognition as "chief rabbi" of "Torah-true" orthodox Jews in Vienna, something not easily attained, so he's gotten a friend to go to bat for him. Which gets me to thinking: How is it that their so-called zealots, in whose heart burns a love for Hashem can join with murderers and Nazis? I can understand throwing stones, burning trash bins and the like, but this? Does this mean that all zealousness is nothing more than anger and negative energy channeled incorrectly, and that had these people been born Muslim they would've been Muslim extremists? The Torah is full of examples of zealousness, from Pinchas on, so they do have a platform to stand on, but is this what was meant? Seems like every Joe has his own blog these days. This dude here got himself fired for blogging about his job, a mail-room job no less, complete with ragging on his co-workers and boss. I guess he had plenty of free time with which to blog, which brings me to my dilemma. People are busy preparing for Shavuos, each in his own way. If you read the "Charedi" press where they bring aticles from today's gedolim, or listen to Droshos from today's Darshonim, then you would see that the preparations that involve the male segment of the population all involve strengthening their commitment to studying Torah. The women I won't bother with now, they've got enough on their minds. On Shabboss afternoon in the Chabad Shul the Mashpia speaks about the Mitteler Rebbe , when asked what he would like to merit this Yom Tov, he says, to feel the "Lahavas Eish" that burns in the hearts of the Ish Poshut. The Talmid Chochom is like the Eitz Hasodeh, the imposing tree, but the Ish Poshut is like the Sneh, the burning bush, that does not get consumed by fire, it's always hungry for G-d. So, although the Torah is what connects you to Hashem, the Ish Poshut is appreciated more for his sincerity, for his words of Tehillim, his simple recitation of the words of Torah. These wordsof the MR are based on the appreciation that the Baal Shem Tov had for all Jews, especially the simple ones. So why is Chabad the only group that continues to preach this angle? Why has it happened that in all other Chassidishe circles the ideals of the Yeshivah world have seeped in so strongly that only the learned are appreciated and respected, and the simple ones frowned upon? That's not to say that learning isn't condoned and appreciated, on the contrary, Chabad was organized in order to strengthen the learning and deeper understanding of Chassidus. They have managed however, to realize that the greatest Lamdan and "Maskil" of Chassidus can still appreciate the simple Jew. In other circles this seems to have been forgotten. Many Chassidishe Bochurim that have a Geshmak in learning run to the Litvishe Yeshivos in Eretz Yisroel and elsewhere. They adapt the Litvishe style of learning and are embarrassed to be associated with the simple Jews, so much so, that in many cases they're ashamed of their own Minhogim, looking at them as a complete waste of time. Shavuos is a time when this manifests itself for all to see. If you look around your Shul, and you see a young man or Bochur in the Chassidishe levush learning Gemorah instead of sayig Tikkun, that's your man. So, next time you hear from a Chassidishe Yungerman, that you "live in a different world", tell him he's right, because you're living in the world that the Besh"t left for us. There were a couple meetings where they determined this. Right now it is a "strongly advised recommendation to parents." Official enforcement has not yet begun. When discussing the closing of Eitz Chaim in Volozhin a quote is brought in the name of the Chofetz Chaim. As is known to many, the Netziv did not buckle to the pressure of the Czarist regime and would not implement the teaching of secular studies in the Yeshivah. The Chofetz Chaim was said to have claimed that "had Volozhin implemented secular studies, the Torah would have been forgotten". Much has been said here and in other forums about the so-called "superiority" that Lubavitch claims when discussing other groups, how they're the only "true" Chassidus, and how they try to "chap arein" Neshomos. It is true that it has become part and parcel of the upbringing of a Lubavither Bochur to try and bring others into the fold, whether they're currently religious or not. The superiority factor is what gets me peeved. How does this differ from what the average "Lithuanian" Bochur is taught, namely, that The true way is his, and that a Chasidishe Bochur wastes his life away by eating Kugel at the Tish of his favorite Rebbe? How does it differ from the fact that the CC opined that although there were thousands of Bochurim in Poland, Hungary, and in non-Misnagdic Yeshivos with hundreds destined to become the leaders of the next generation, there would be no continuity of Torah? What about the fact that in most Litvishe circles the derech of Pilpul in Peylishe Yeshivos was considered not toiling in Torah, and basically Bittul Torah? Yes, I can understand that he worried about the effect that the new decrees would have on other Yeshivos in Czarist Russia, but what about the others not in the Russian sphere of influence? Did he think it would spread to other countries? Otherwise, why make such claims? Oh, and don't get me started on the beginning of Chassidus, what was thought of Chasidim at THAT time. The haters grab onto anything they can, as weak as it may be, like a last straw. One of the "exciting quotes" they love to use is "Nishtakcho Toras HaBaal Shem Tov", ח"ו. They fail to tell you that the source for their so-called proof is the Rebbe of Kopust, the Mogen Avos, grandson of the Tzemach Tzedek who said that Chassidus was meant for only 150 years. His cousin, the Rebbe Rashab, fought vehemently to negate those statements, saying " איך קען אים צוברעכן ווי א פאפיראס"!, and announcing that Chassidus vet Leichten biz Moshiachen. I do not wish to make this blog into a forum for the attackers of Lubavitch, but I need to defend what's right. They use Kopust, which HAS become Nishtakech, for their sources when it's convenient, and disregard them when it's not, just like any good writer would. 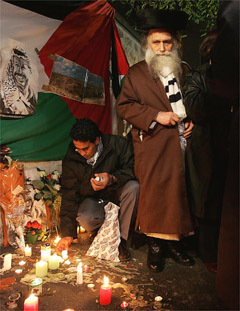 Pointing to others and telling them to follow "their Rabbeyim", like they do with their juvenille understanding of the Kuntres HaMa'ayon, as well their understanding of the Belzer Rabbeyim's positions on Zionism, among others, is another way of negating everything anybody else has accomplished. Why is this so exciting to them, aren't they too followers of the Besh"t? The answer is quite simple. They have nothing but hate of others to offer to their multitudes, nothing positive or educational, so they attack others in any way possible. Once what the other guy has is false and outdated , you and him are on level playing field. He then sticks out his "Kosher ----- Fislach" and says "look at me", "look at our modest women", we are pure and holy souls, everybody else be damned. You might say, "well, aren't they right? ", do we act and do what the Besh"t did and expected from his followers? Maybe they've got a point? The answer is quite simple. "You reap what you sow" is what they say in the agriculture business, and so goes it with any other business. Educating in the ways of the Besh"t is no easy task and can be very easily misconstrued, as is evident from the infighting going on in many circles today. This has become increasingly so in the current generations when all the emphasis has been placed on the outward appearance, and, on the flip side, no emphasis on outward appearance. Just the fact that today there is no Kopust, which after the Tzemach Tzedek's passing took a large part of Chassidim, and maybe even the majority, shows what lack of education can do. We need not look further than American Jewry in the late 19th and first half of the 20th centuries. The haters have no problem educating the masses, it does not take much, just ask the Imams and clerics in the Middle East, a little truth mixed in makes a big lie go very far. Those who educate in a substantive way find it harder to be successful, because it's not easy to claim success when much is expected. I don't understand the people that try to forcefully bring about the redemption and Bais HaMikdosh. Now we hear that the Sanhedrin is going to be renewed according to the qualifications of the Rambam, with 71 rabbonim in attendance. They also say that all members will have to dress according to the laws of Tznius, I'm not quite sure what that's about though, maybe they'll accept women? The team has set up a six Rabbi group to work on getting The Gedolim in Israel on board, good luck to that. The thing I can't understand is that according to Arutz 7 they've asked Rabbi Adin Steinsaltz to become the Nassi, something he only refused due to him not "being worthy". Is that the only fault he found with the Sanhedrin? Gershon Jacobson (Yakubashvilli) died last week. This is news to no one. In recounting his years as editor of the Algemeiner Journal, much was said about him in Charedi(man, I hate that word, especially in English literature)circles, much of it negative. The reason is mostly because he disrespected Gedolim (there's another English word for you). One may wonder, "well did he? ", and if he did then maybe the criticism is warranted? But what they fail to realize is the one-sidedness of such a comment. While all other newspapers who spew their hatred of anyone minutely different on a daily or weekly basis are considered "organs" and "mouthpieces" of The "charedi" and "torah" communities, for some reason Gershon's mostly DEFENSIVE stands and opinions were derogatory and disrespectful. Was he expected as the only (somewhat weak) voice Lubavitch had for many years in the Jewish/Yiddish press to sit quietly and just take it from everybody, i.e. "Turn the other cheek?". Are people so stupid and short-sighted? It has become increasingly popular for amateur "historians" to "Monday morning quarterback", particularly when recounting the events of WWII, and what many could've or should've done. I'd like to play "devil's advocate" (a term I wish I could avoid) on an issue that hasn't been addressed much. The late 19th and early 20th centuries were decisive times for the Jewish people, when the course of our history changed, never to be the same. At that time the Rebbe Rashab sent emissaries to the Eastern Republics of Georgia and Uzbekistan, including Samarkand and Bukhara. Some of the more famous ones were Reb Shmuel Levitin, Reb Michoel Lipsker and Reb Avrohom Levi Slavin (speaking from memory). 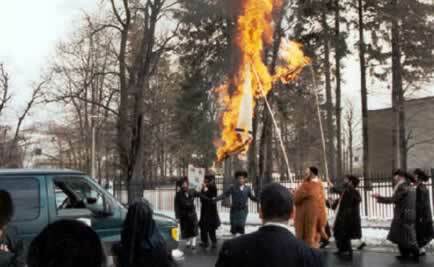 His son, the Rebbe Rayatz, continued this tradition. At the time that those emissaries were dispatched to those countries large chunks of European Jewry were being torn away from their roots by every Socio-Political movement theretofore known to man. Everything from Zionism to Socialism to Communism had a large representation from all walks of Jewish life, yet nothing was done to stop this riptide. Most of the movements also were very well represented in all of the European "Torah centers", something that is very well documented, and that maybe could have been stopped by showing the learned ones the errs of their ways. I definitely believe the Rebbe would've done things differently, including instituting the programs he later did at a time where it would've been most unpopular, and in that sense the Rebbe did differ from his ancestors and predecessors. The Eastern Republics mentioned were under no spiritual threats at that time or for decades to come, at least not until the Rise of the Bolsheviks, and had it much easier than their western brothers after that. Could it be because they were still untainted, not affected by outside influences and were therefore salvageable? Was it because there the Shluchim could work without bother? Was there not enough manpower for the fight on both fronts? Please do not read more than is meant into this post. Chas Vesholom for me to question the ways of the Rebbeyim. השם הטוב יכפר בעדי. I'd love to hear from you on Ideas to write about, so if you got something to say, e-mail me, please. Thanks. Bloggers are everywhere, sprouting like mushrooms after rain, myself included. A large part of Jewish bloggers are "heimishe" people, mainly men, who are fed up with the way the current system is set up and use their blogs as an anonymous means of ranting against their society. Yet, none of them has the fortitude to do anything more than blog, that is to take steps to make some sort of change. Now, some of you may say "what can one person do to change all of society? ", The answer is plain and simple, start with what you can change, namely, your own family. I believe it to be the case that most of these frustrated types do stay in the same society and then subject their kids to the same schools and Yeshivos they went to, many times the exact same schools with the exact same Rebbeyim/Teachers! If in your case it was only a teenager who had a hard time in school, and you now realize that the school was not to blame, then if your kid won't have the same problems, send him back there. However, if you have a beef with the society dumbing down your kids, making of them nothing but mindless fools who can't hold a conversation with anybody not wearing a long black coat, THEN DO SOMETHING ABOUT IT! Share some of your knowledge with your kids, spend some time with them, and most of all, tell them about G-d's green earth. I am aware of the inhibitions society places on us, and I'm not condoning teaching your kids about "the birds and the bees" at 5 years old, but there's a lot of gray area. Telling your kids that what he's learning in school is wrong or stupid does create disdain for his/her teachers and is probably not the right thing to do, so use caution, especially at a very young age. Seems like after cellphones, sheitlach, and water comes shavers. Now, don't get me wrong, I don't shave my beard, nor do I condone it, but this too much. Rabbi Mordechai Gross, who's the Rav of "Chanichei HaYeshivos" in B'nei Beraq and an up-and-coming "Godol" now wants to give a Hechsher on shavers. The problem is that( I think ) most people are fed up with the racket named Hechsherim and don't buy into it. It's not like it's a new problem like the Internet that needs to have filtering software, or some other new "problem" that's been "discovered". Shavers are nothing new, and there has been a list of kosher shavers for as long as I know. So, why the need for a Hechsher, just so the papers should have more to laugh about? Kudos to Rabbi DM Druckman Chief Rabbi of Kiryat Motzkin, Israel. You may not agree with all his antics but he's consistent and a fighter. The good rabbi has been fighting the "disengagement plan" since its inception, and he's taken it to the next step. According to CHABADNIK Rabbi Druckman is moving to Gush Katif tomorrow and will move his family there after Shavuous. When asked how how he will manage his role as Chief Rabbi, Druckman said "I'm not moving to the dark mountains, I'll be here in Israel." "Mayors and MP's take vacations all the time, I'll be here."